The shift toward automation is about to create a tsunami of unemployment. Not in the distant future--now. One recent estimate predicts 13 million American workers will lose their jobs within the next seven years-jobs that won't be replaced. 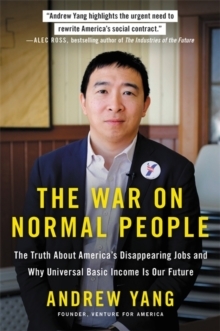 In a future marked by restlessness and chronic unemployment, what will happen to American society?In The War on Normal People, Andrew Yang paints a dire portrait of the American economy. Rapidly advancing technologies like artificial intelligence, robotics and automation software are making millions of Americans' livelihoods irrelevant. The consequences are these trends are already being felt across our communities in the form of political unrest, drug use, and other social ills. The future looks dire-but is it unavoidable?In The War on Normal People, Yang imagines a different future -- one in which having a job is distinct from the capacity to prosper and seek fulfillment. At this vision's core is Universal Basic Income, the concept of providing all citizens with a guaranteed income-and one that is rapidly gaining popularity among forward-thinking politicians and economists. Yang proposes that UBI is an essential step toward a new, more durable kind of economy, one he calls "human capitalism."